To gain the maximum benefitts from the Glass and Stainless products and projects, the correct care and maintenance procedures should be followed during and after installation. To help with this we offer a range maintenance services and aftercare products. To achieve maximum corrosion resistance and appearance, the surface of the stainless steel must be kept clean; this is extremely important when used in an external environment. It is necessary to clean your installation immediately after fitting is complete using G&S Stain Remover. Following this, periodical cleaning with Glass and Stainless’s Stainless Steel Cleaner will help form a protective barrier against the atmosphere. approximately every 3-6/6-12 months thereafter. For installations in aggressive environments, for example coastal regions and swimming pools, you will need to take particular care with cleaning and maintenance to inhibit corrosion. The cleaning schedules relating to these types of areas are much more frequent than standard external installations. In addition, we strongly recommend that only mirror polished items are installed in such environments due to their higher corrosion resistant finish. To assist with care and maintenance we can provide Stainless Steel Cleaner and Stain Remover. Stainless Steel Cleaner is a general purpose stainless steel cleansing spray. It can be used in conjunction with the Stain Remover or as a cleaning product in its own right to clean and shine stainless steel. with water which neutralises the acid and causes the passive layer to regenerate on the surface of the stainless steel. This surface should be periodically protected with our Stainless Steel Cleaner. Always clean your installation once it has been completed. This is necessary to remove any contaminants on the surface of the material to prevent future problems and leaves a finished look behind for your customer. For outstanding results, use our Stainless Steel Cleaner for internal installations and our Stain Remover followed by our Stainless Steel Cleaner for external applications. ff straight away with water. 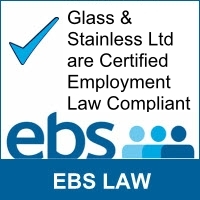 Whatever your bespoke glass aftercare or stainless steel restoration and maintenance requirements Glass & Stainless Ltd can help.